Home Entertainment or Dedicated Home Cinema…. which range is right for you? Let’s take a look at the benefits of each, and how to make the right choice for your system. The Home Entertainment range covers most users who want to experience great sound in their living rooms, rumpus rooms, bedrooms, media rooms, home theatres, kitchens, dining rooms and nearly every other zone in and outside the house. Offering a choice of stunning timber speakers as well as concealed and outdoor models, you can enjoy great sound while still matching a particular décor or installation requirement. Would you like your speakers to blend in, or be a talking point in the room? You can choose a real timber veneer finish to match your entertainment unit or to make a statement in the room. Perhaps a custom satin or gloss paint to really express your style? The black woodgrain vinyl finish is another great option for those that like the allure of an elegant dark finish with a slightly lower price. Size matters… the Home Entertainment range takes many forms and it’s important to choose the right one for your environment. Floorstanding speakers can take up valuable floor space, but multiple drivers and larger internal volumes will reward you with deeper bass extension and higher output to create a “larger” sound. Bookshelf speakers sit upon stands, entertainment units or cupboards – and can offer surprising performance while taking up very little space. 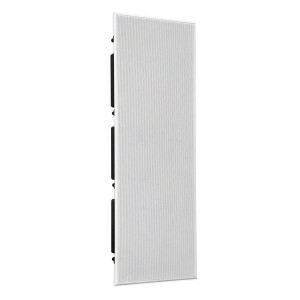 If you’d prefer a more discrete approach, then concealed speakers may be the answer. Hiding behind slim bezel grilles, these in ceiling or in wall speakers have been perfectly tuned to their enclosures – meaning you’ll get consistent and dynamic soundtracks accompanying your favourite movies, all while hidden from view. If you want the full performance of floorstanders while still being concealed in the wall, we have an option for that, too. The Krix Symmetrix offer outstanding performance and fit within a 70mm wall cavity. What about performance? The good news is that our range of Home Entertainment speakers are designed to shine in both music and home theatre use. Ring radiator tweeters and custom built bass drivers ensure you’ll have a silky smooth top end blended perfectly with the midrange and bass, thanks to expertly designed crossovers. One moment they’ll delicately recreate Adele’s performance at the Royal Albert Hall, then happily switch gears to Marvel’s latest superhero blockbuster. Pair them up with a quality AV receiver or amplifier and you’ll have friends inviting themselves over for parties and movie nights on the couch. Lastly, it’s worth thinking about the SPLs (sound pressure levels) you want to achieve in the room. 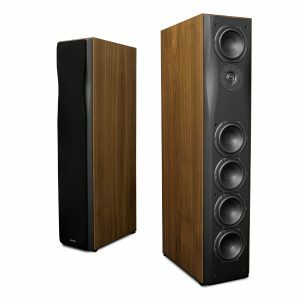 If the room depth is reaching past the 6 – 7 metre mark and you’re wanting levels of 100dB or more (read: very loud), it may be worth thinking about some of the speakers in the next section! For summaries on each category, feel free to head over to the Home Entertainment page. So, you’re planning the build of your new house with a dedicated home cinema room, or you’ve just renovated the garage and turned it into your dream man-cave (or she-shed). If you’re looking for the ultimate, high energy, direct cinema sound you experience at the movies, then the Dedicated Home Cinema Range is for you. Featuring high power handling, high sensitivity and controlled dispersion, this range is capable of exceptional output levels at very low distortion. Decades of our research and innovation in cinema loudspeaker and horn design are employed in this range – and you can reap the rewards! In cinemas, the front left, centre, right and subwoofer speakers are built in behind the screen – so all the dialogue, effects, action and music come straight through the picture, completely immersing you in the action on screen. Many dedicated home cinemas are now reproducing this type of setup by placing high performance speakers behind an acoustically transparent screen. Other rooms lend themselves to speaker placement on the floor, installed inside a wall cavity or mounted to the wall. Regardless of installation type, in the dark, moody lighting of a dedicated room, beautiful woodgrain finishes aren’t considered as high a priority any more. Clarity, power and performance reign supreme. To this end, the cinema black finish on the dedicated range is a little more aggressive, industrial-esque and hints at the beast within. The Dedicated Home Cinema range is made up of 3 sub-ranges that fulfill differing installation requirements and output levels: SX, MX and X. Let’s take a quick look at each. For small to medium size dedicated cinema rooms up to 8 metres in length, Series SX speakers bring the cinema experience to your home in a relatively compact form. They can be placed behind acoustically transparent projector screens, mounted on walls or free-standing in the room. 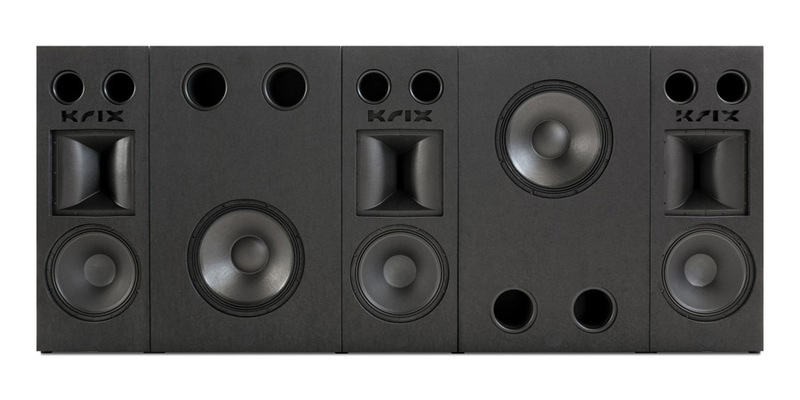 The mains utilise Krix’s proprietary waveguide for optimum dispersion, while a higher sensitivity means even mid-level AV receivers are capable of driving them to high volumes with extremely low distortion. Series MX are unique, modular systems that suit rooms up to 12 metres in length and are designed to sit behind acoustically transparent projector screens. Depending on the install, some form of framing and plinth are required – so best to chat to your Krix dealer about this in the early stages. All three main speakers and two subs are included, so you have a cinema wall of sound ready to go, without a speaker in sight. Luckily, you won’t have to give up too much space, with the largest system requiring only 335mm in room depth. What you will gain though, is clear yet powerful cinema quality sound, with a treated infinite baffle wall behind the screen ensuring all energy is directed through the picture and straight into your seat. 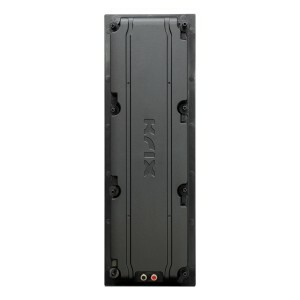 Two models are available, the MX-20, closely aligned with the Series SX range (Krix proprietary waveguide and 10” bass drivers), and the MX-30, which is closely aligned to the Series X range (Krix patented constant directivity compression horn and 15” bass drivers). Going all out? Series X is for you. These larger speakers also sit behind acoustically transparent projector screens, either on the floor or on plinths, and require a maximum depth of 460mm. 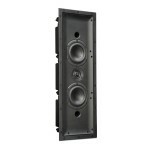 Capable of filling rooms from 5 metres to 25 metres, these speakers are not for the faint of heart. Available in 2 way and 3 way designs and standing up to 2 metres in height, they utilise large 15” bass drivers and Krix’s patented constant directivity compression horns, for the ultimate in power and scale. So there you have it, a short guide on which range might be the right choice for you. Remember that there is no exact formula – our home entertainment range can be an outstanding fit for your dedicated home theatre room, or you may appreciate the look and performance of Series SX speakers in your living room… it all comes down to creating the right synergy for your home. If you have any questions feel free to email us at [email protected], drop us a line on our Facebook page, or visit your closest Krix authorised dealer.